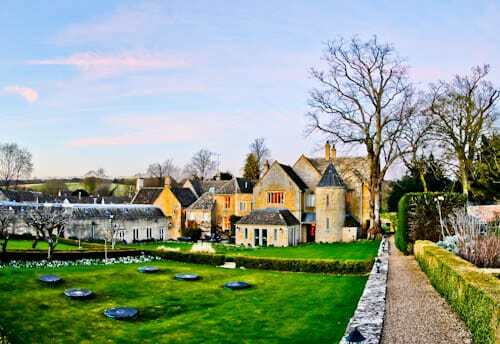 The Lords of the Manor will guarantee you a true Cotswolds experience. I recommend you book direct on the Lords of the Manor site for the best rates as well as late check out. 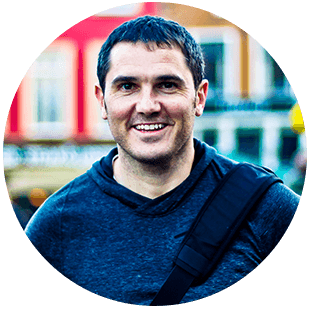 Additionally, do check the Twitter, Facebook and Instagram feeds for the latest events and pictures. 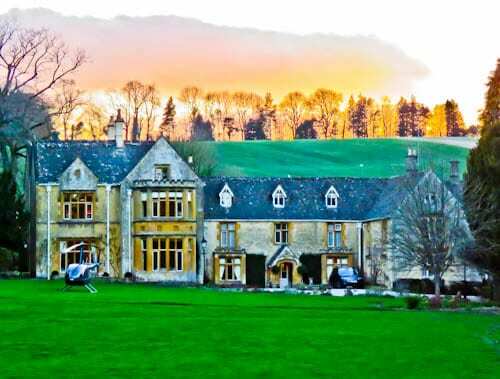 The Lords of the Manor hotel is in Upper Slaughter, Cotswolds. 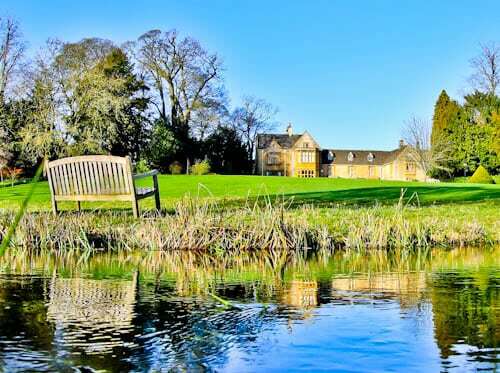 As well as being surrounded by 8 acres of private gardens, it’s also close to the quiet picturesque villages of both Upper and Lower Slaughter. In addition to this, there are well marked walking trails in the area. The best way to arrive at the Lords of the Manor is by car. You can park at the secure onsite parking facility. Alternatively, you can take a train to Moreton-in-Marsh followed by a 20 minute taxi ride. 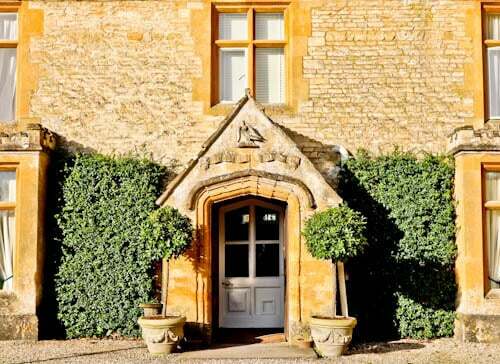 The historic entrance to the manor dates back to 1649. This manor has increased in size over the years but the entrance you see is original. Your first glimpse of the historic entrance will likely be as the hotel porter comes to assist you with your bags. As you enter the manor you get the first glimpse of interior. In fact, the building maintains a homely feeling although it’s large manor. Feel free to explore the manor and its unique decorations. You’ll find various interesting artefacts from the historic coat of arms on the fireplace to a rabbit shaped lamp. Lastly, the friendly staff at reception will be happy to answer any questions you have about the manor. 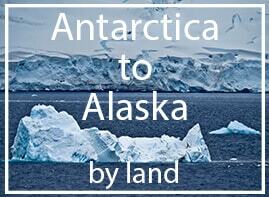 From its deep history, to the local walks as well as the current dining schedule. 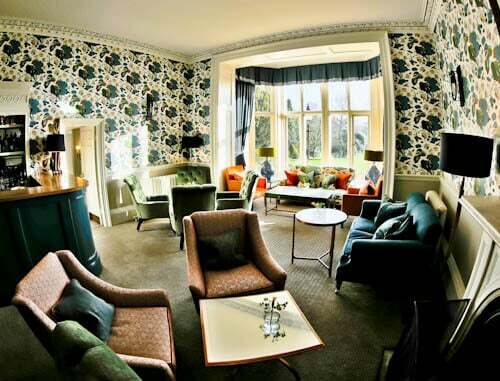 For the true manor experience I recommend the Manor or Cotswold rooms. Have you slept in a room with low beams before? 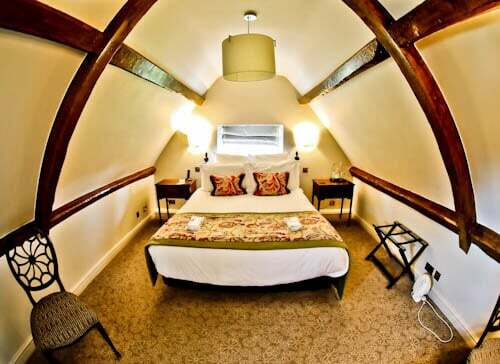 Other spectacular rooms at the Lords of the Manor are the spacious Lords bedrooms. One of these features a 4 poster bed which I recommend you book well in advance. 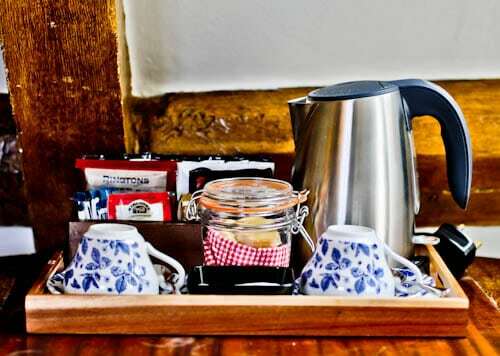 Whichever room you choose at the hotel, you can enjoy a complimentary minibar of tea and coffee throughout your stay. 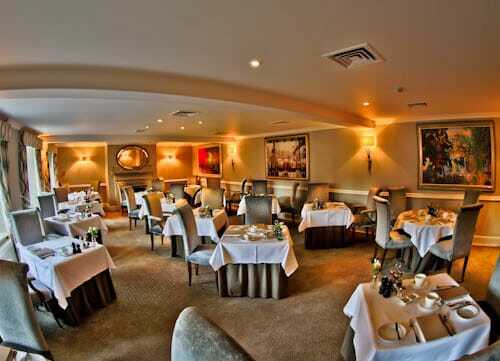 The fine dining experience at the hotel has been awarded 3 rosettes by the AA. 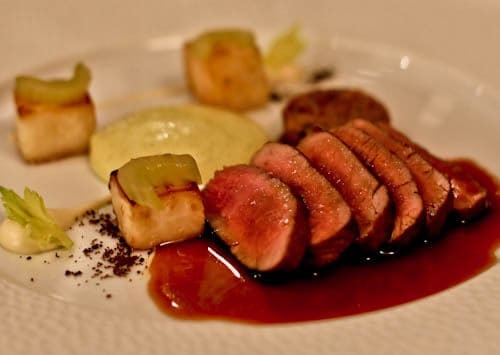 As a result, it’s officially one of the best restaurants in the UK. Dress up and prepare yourself for one of the finest dining experiences of your life. The seven course tasting menu I enjoyed was an appetizer followed by veal, brassicas, cod and beef. Afterwards was a pre dessert before a Rum Baba for the dessert itself. Additionally, you may complement the tasting menu with a selection of cheeses. 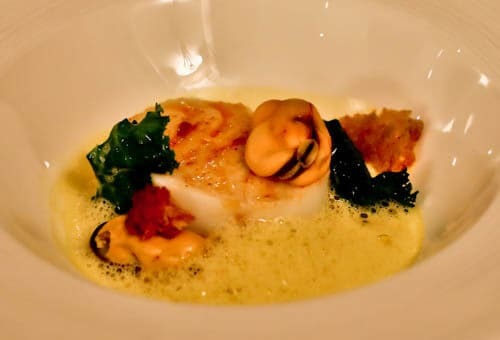 The A La Carte menu features a first course, main course as well as the all important dessert. For the first course I had a choice of veal, risotto or foie gras. Main course was a choice of halibut, beef or lamb. I must say, the lamb was delicious! Finally, this menu is only available on sundays whereas the seven course taster menu is available daily. The critically acclaimed menus are complemented by a large selection of fine wines. 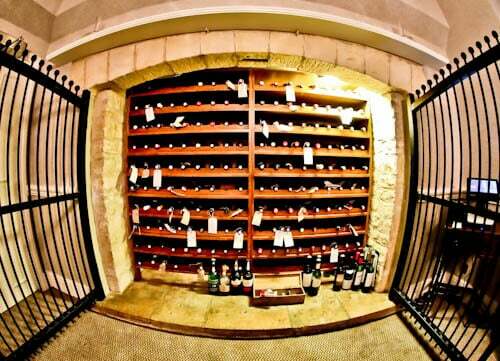 As a matter of fact, those particularly interested may even organise a special visit to the onsite wine cellar. Most importantly, if you need recommendations for wine pairings a Sommelier is always closeby. The lounge and bar areas are perfect for relaxing and enjoying a drink. In addition, afternoon tea is served here daily. Sit by the huge bay windows for stunning views over the garden areas. On a beautiful day you can enjoy your drinks outside. As a matter of fact, your afternoon tea can also be served outside. Did you know the whole garden area of the Lords of the Manor is over 8 acres? For this reason, you can take a peaceful evening walk without leaving the premises! The Cotswolds is famous for its cute English cottages, rivers and greenery. The Lords of the Manor offers not only these famous sights but also the opportunity to explore the interior of the historic manor. In the center of the manor is an elegant staircase. Those who like to dress up for photos can can capture some wonderful pictures on this staircase. Combine this staircase with the elegant paintings on the wall and you can take a truly memorable photo. 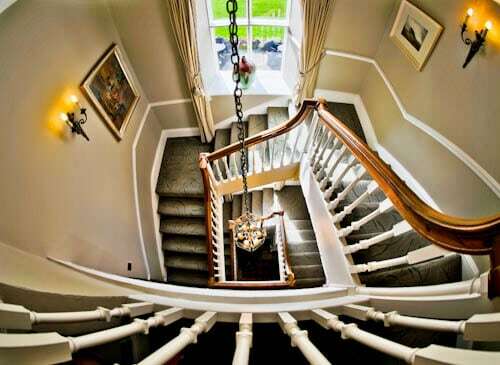 As a matter of fact, if you choose a Manor Bedroom it’s likely you’ll ascend this grand staircase to your room. An alternative place to enjoy a drink or even afternoon tea is in one of the more private public areas. 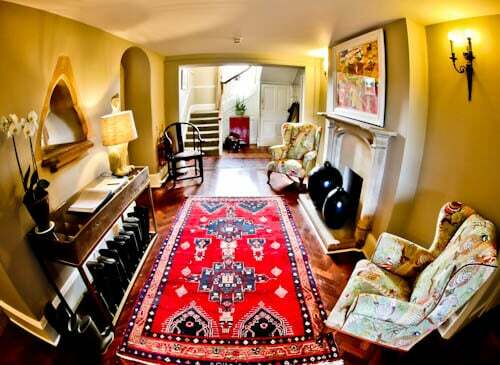 I mentioned taking photos all dressed up, how about an elegant picture in this Cotswolds themed room? 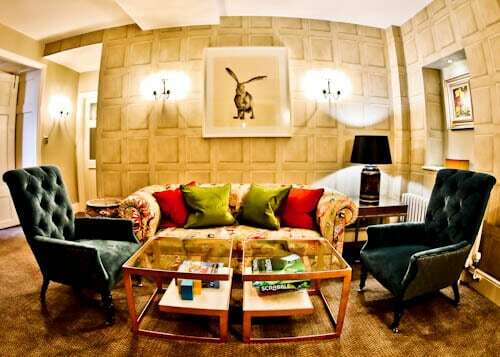 One of the public lounges features a picture of a hare. You may not be guaranteed a hare sighting whilst you explore the Cotswolds but you certainly see one in this public area. As you explore the 8 acres of gardens at the Lords of the Manor you’re guaranteed to find some majestic sights. One of the most majestic is a view of the manor itself at sunset. Be sure to fit the sunset into your schedule! 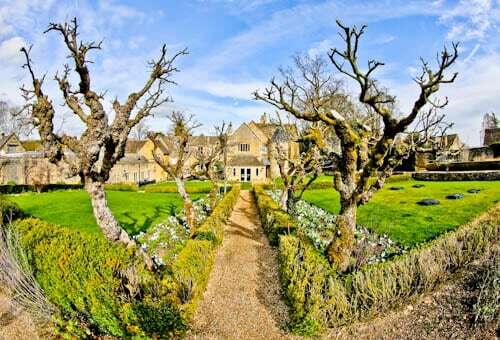 I recommend you book direct on the Lords of the Manor site for the best rates as well as late check out. Additionally, do check the Twitter, Facebook and Instagram feeds for the latest events and pictures. 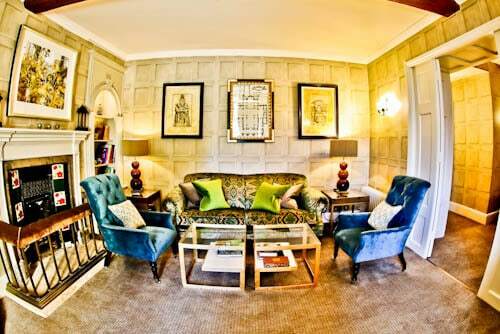 Visit the Lords of the Manor sister hotel, The Feathers Hotel in Woodstock.